KEEP was an amazing experience for me and I'm grateful that I had the ability to go with the support of my community - friends, allies, family. 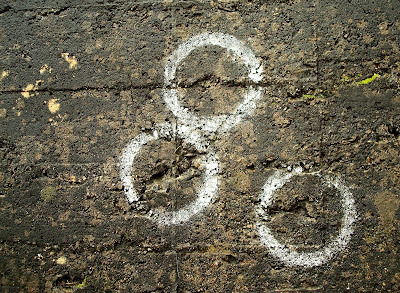 It felt like my circle was coming back together on itself and my ends were meeting and connections were being made. Synapses firing and all that. I have to also shout out Susie Woo who taught a course called "US Imperialism in the Asia Pacific" for greatly expanding my thinking about the forms imperialism takes in these days of economic, cultural and military imperialism. I feel lucky to have had people help me gather these building blocks, who have helped me learn about the impact of US forces in the Pacific Rim. This summer on KEEP was yet another opportunity to bring these things together. I got to connect with Go Yookyung again and learn more about how the Eradicators' struggle in Korea has shaped up over the past 17 years. We had the chance to hear a bit more about the long and sustained struggle they've committed their lives to. They've been fighting and fighting HARD to change public perception about the bases and US military occupation particularly around sexual violence, environmental damage and national sovereignty. The other thing I have been thinking a lot about is symbolized by the changing faces of the camptown women in Korea. We learned that many of the women in the camptowns are now coming from the Philippines on "Entertainer" visas and it was hard to internalize the fact that Korea is in a place where there are forces acting on it (through institutional, personal, environmental and economic violence) but it's also now in a position to replicate some of the same oppressive behaviors on these women coming in from the Philippines. Then there's the migrant workers, the mail-order brides, the biracial war orphans, etc. 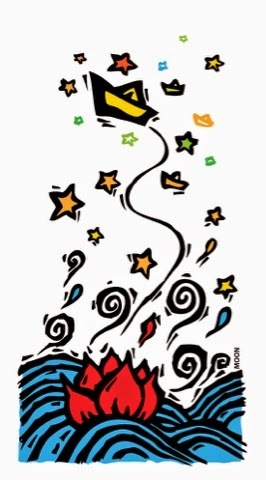 This is not about airing dirty laundry. This is about acknowledging the real layers of oppression, privilege, power and control in place. It's been really interesting to push myself around thinking about Korea and Korean identity as deeply rooted in experiencing colonization and building national resistance histories yet also being seated in a position of relative privilege on a global scale. It's also been really challenging thinking about how our, the participants of KEEP, position in North America puts us in a similar position. As East Asians within the label of of Asian Pacific Islander and as East Asians within the larger racial justice movement we are not facing the deportation like our Kimay comrades nor are we the usual targets of violent profiling. And personally I've also been thinking a lot about the privilege that I have as a Yale graduate, as a US citizen and as an English speaker within a lot of these contexts. These are conversations that I've been having with myself and with others in my community but going to Korea has helped me to further contextualize my position in a larger struggle for social justice in the world. Locally, in Seattle, I've also been thinking a lot about the opportunities we have to connect with many different communities and combine our work. We've been collaborating with NAPAWF Seattle (National Asian Pacific American Women's Forum) and with Pinay sa Seattle (formerly of Gabriela Network) with further plans to work together around reproductive justice issues and around militarism, militarized prostitution and trafficking. KEEP was, for me, an opportunity to learn and grow in my analysis and in my commitment to a global movement. It has helped me understand some of my reluctance to work solely on Korea related issues and helped me identify the way I want to plug in to that movement. It was also an amazing way to make contact with folks that I hope to deepen in the coming years. In my relative youth, I feel excited about the future and deeply respectful of the work that's come before me. One sleepless night in Seoul, I wrote a note to myself about what history means to diasporic Koreans in the US, residing in Cold War communities, one generation removed from the pivotal events that changed the course of history on the peninsula forever. I was thinking about this conundrum, of being in Korea where the state media is being reshuffled under Pres. Lee Myung Bak, of life post-KEEP, when the days are no longer packed with site visits with people with fire in their eyes. It means, first and foremost, that you get an official history that only later, you realize, is the equivalent of reconstituted meat parts vacuum-sealed in tins and stamped for approval by the US State Department. When you 'return' to Korea, it means constantly being on a scavenger hunt for meaning, and at first, everything satisfies, sometimes the packaged homeland tours, sometimes just the food speared on a stick under the shelter of a colorful umbrella, the vendor speaking to you like you’re her child. It means you visit ‘memorials’ meant to shut you up. It means something clean, like the preserved palaces of Kyungbokgung, it means everyone and everything would like to start over; can we please start over? And yet, if you refuse the shiny tins of official state history, the amnesiac routes of tourist packages, then where do you begin? 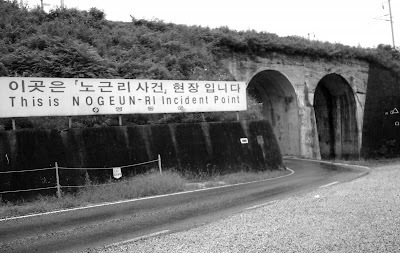 Like much of the world outside the directly affected families, I learned about the Nogun-ri civilian massacre committed by the US military in 195o through AP reporters. I remember opening the New York Times in my college dining hall in 1999, a day just like any other day, and reading the front page report. The news exploded in my head- that before and during the war, the US army had approved, observed, and directly participated in the killing of Korean civilians without due process or trial, in a period AFTER the US had signed the Geneva conventions (which are meant to protect against the indiscriminate slaughter of civilians during wartime )- and not only this, that the US government had classified the relevant documents and that the South Korean government had suppressed it for almost 50 years. Since 1999, the report, the South Korea Truth Commission has built up a docket of at least 200 such cases. This summer, I had the chance to visit three such sites. I am starting with Nogun-ri because that is where it all started- when those who knew what had happened under the administration of Pres. Syngman Rhee, during US military rule (1945-48) and the Korean War were finally legitimated, when the investigations by the newly formed national Truth Commission could finally begin. I found the huge sign somewhat ironic considering that, for much of the previous fifty years, it had been kept secret by the South Korean government. The politics of naming is also evident - who knows what an 'incident' is, or a '사건', unless you already know what happened at Nogun-ri? 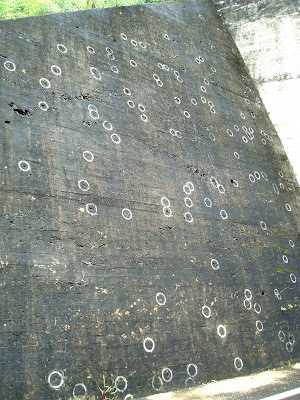 Nothing to indicate that this is where planes bombed down upon unarmed refugees and US ground troops fired into both ends of the tunnels. 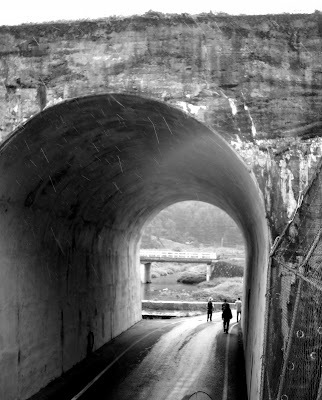 You have to walk through the tunnel to find the small memorial where you can commemorate those who have been killed. Walking through the tunnel is not easy; you can just read the information panel and skip back to the car and drive off into the sunset. 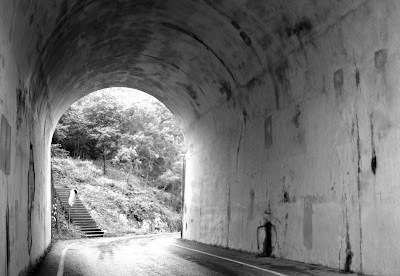 But walking through the enormity of the tunnel alone, it struck me; what it would feel like to hold on those memories for decades, to survive and survive and survive that experience without anyone listening, to be persecuted for even remembering -- how long did that tunnel feel? 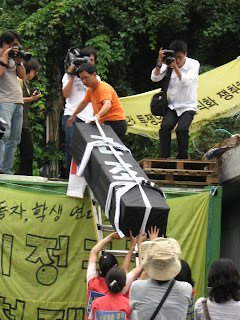 "I deeply regret that Korean civilians lost their lives at No Gun Ri" (2001). This is like the classic New York Times byline on every article about Korea ("Korea was divided in 1945"). By who? A language completely lacking in any accountability. In any case, I think there is a different kind of power in the histories that get buried for so many years. Sometimes I feel despair when I know that survivors are passing away without getting any justice, that Pres. Lee Myung Bak tried to bury the National Truth Commission by next year, that his mantra, 'Let the past be the past,' sounds appealing to many. But things can grow in the dark, the direct memory of experience can translate into so many other forms for the following generation, and there are so many people who are inspired to take part in movement work because of news that explodes much later into the light of day, like the 1980 Kwangju massacre, the 1948 Chejudo massacre, and for me, the 1950 Nogunri civilian massacre. This is not a history of sound bites, of boring reading assignments, of things under glass cases in museums. This is a history, literally, of bones that talk. Now that KEEP is officially over, though unofficially we're still going to be visiting some organizations again, I'm going to take a moment to reflect. The first thing that I was struck by in meeting all of these progressive, anti-imperial, and anti-US organizations was the intensity of their movement. These are people who will patiently and diligently hold a rally once a week outside of the US base for 17 years knowing that change does not come quickly. 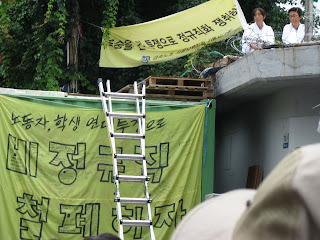 The Eradicators started their rallies with little support from the general Korean public while facing a society that supported the American troops in Korea. At this point, they've built awareness, fought battles and created connections to anti-US occupation movements in many parts of the Pacific Rim including Okinawa, the Philippines, Guam and Hawaii. The other thing that struck me is how easy it was for me to miss all of this 투쟁, all of this struggle, on my other visits to my mother's land. Contrasting a tourists' visit to Korea, or even a typical Korean American's visit, to the collective experience that I've just had is more than just night and day. It's startling and yet somehow to be expected. During the weeks that I've been here I've seen more protests, sit-ins, demonstrations and rallies that I would have in months in the US. But the control of media, the insidious neoliberal goverment policies and the general apathy that I've also seen here makes clear to me how difficult it is for movements to gain ground and grow. The final thing I'll mention before grabbing dinner: Lee Myung Bak tried to institute an "English Only" policy in the public school system. How twisted is it that 63 years after Japanese occupation ends the head of this "democratic" nation replicates that model with it's new colonial master? It makes me more than a little sick just thinking about it because it's harder to fight something like that than it is to fight a very clearcut imperial presence. The real final thought that I'll expand more on later: Nationalism and it's role in Korean movement culture. Thanks for tuning in folks. I'll have better posts with more pictures as the days go on. I thought it would be important to get some thoughts out first though. Also, most of this will be coming from memory since I lost my notebook with all my notes in it. Bear with me if it seems like I'm not sure of some of the details. In solidarity with families of long-time political prisoners. We the Korean Exposure and Education Program, KEEP, stand with you today in solidarity for our shared struggle against the National Security Law and criminalization of political dissenters and democracy activists. We join the call for the basic human right to organize, for freedom of thought, and freedom of assembly. We condemn the illegal denial of due process for arrested activists and the brutal torture of activists fighting for social change. We see this issue as not only affecting the wrongly convicted and their families, but also the larger family of Koreans here and overseas, and the larger human family to which we all belong. Your struggle inspires us in our struggle in the U.S. against the Patriot Act, torture, and the inhumane and immoral treatment of so-called terrorists who are invented. Further, in Canada, Security Certificates have been used targeting Muslim men who are seen as threats to national security. They are being held without charge or bail and have been placed in solitary confinement indefinitely. We ask how democracy can be a democracy under these circumstances, when it releases white collar corrupted criminals but not those fighting for the truth? We call for the humanity of all people. To rectify the decades of their lost youth, the tears of sleepless children, the fear theat infects their partners, and paralyzes all of us to work side-by-side for a greater society. We share hope and extend our hearts toward you, the families, and to you, the wrongly convicted, that you remain strong. In solidarity, we will struggle, and in solidarity, we will find justice. 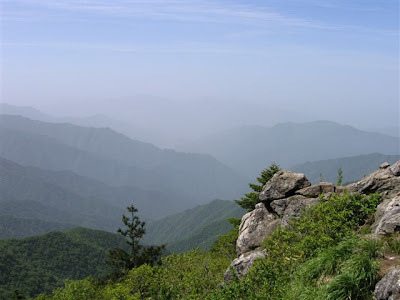 DAY 1, August 3: KEEP 2008 starts by heading from Seoul to Jirisan, or Jiri Mountain, historic site of partisan guerilla fighting against the US military government in Korea (1945-48) and the beginning days of the Republic of Korea through the Korean War (1950-53). It is a mountain full of ghosts, full of history, lost lives, countrypeople who supported the resisters and were killed in turn. 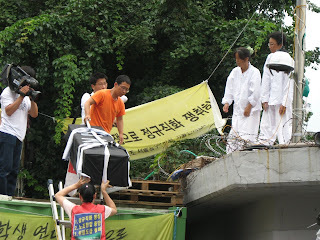 And when people like Korean movement activists climb the mountain, it is not just for the views, the fresh air, the water flowing down the slopes. They go there to remember. "when will it end? 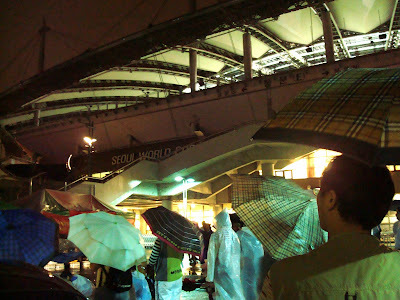 it has been raining for days to weeks non stop"
just to stand and admire the beauty of the corean monsoon rain...."
In the shadow of the World Cup Stadium, Seoul, irregular women workers of the Homever store have set up a tent where they sleep every night, and every Friday, they hold a cultural rally that calls attention to their unjust firing. They are right there, unavoidable, for all the shoppers that emerge out of the subway exit. The indelible image of tens of thousands of people gathered in Seoul to protest the US beef import and Lee Myung Bak's neoliberal yes-man persona is not something that can be blamed away, and yet the government has been targeting certain groups as masterminding the vigils. Join KEEP in celebrating its 14th year for a night of readings and performances from guest readers, learn about previous KEEP trips, and meet with past and future KEEP participants! Lee Herrick is the author of the poetry collection This Many Miles from Desire (WordTech Editions, 2007). He was born south of Seoul, Korea and adopted at ten months. His poems have been published in the Haight Ashbury Literary Journal, Berkeley Poetry Review, Hawaii Pacific Review, The Bloomsbury Review, Many Mountains Moving and MiPOesias as well as anthologized in Seeds from a Silent Tree: An Anthology of Korean Adoptees, Hurricane Blues: Poems About Katrina and Rita and Highway 99: A Literary Journey through California's Great Central Valley. He is the founding editor of In the Grove literary journal and teaches at Fresno City College in Fresno, California. Jennifer Kwon Dobbs is a poet, librettist, teacher, and critic. She was born in Won Su Ji, South Korea. Her debut poetry collection, Paper Pavilion (White Pine Press 2007), received the White Pine Press Poetry Prize. Her poems have been published in 5 AM, Crazyhorse, Cimarron Review, Cream City Review, MiPOesias, Poetry NZ and the Tulane Review as well as anthologized in Echoes Upon Echoes (Asian American Writers Workshop 2003) and Language for a New Century: Contemporary Poetry from the Middle East, Asia, and Beyond (W.W. Norton 2008). Dobbs holds a Ph.D. in literature and creative writing from the University of Southern California and teaches English at St. Olaf College. Kim Sunée was born in South Korea, adopted, and raised in New Orleans. She lived in Europe for more than ten years where she owned an all-poetry bookshop in Paris. She is the author of Trail of Crumbs: Hunger, Love, and the Search for Home (January 2008, Grand Central). Her book, a memoir with recipes, was selected for the Spring 2008 Barnes & Noble Discover Great New Writers Program and is a January 2008 Booksense Pick. She is the founding food editor of Cottage Living and worked previously as a food editor for Southern Living. 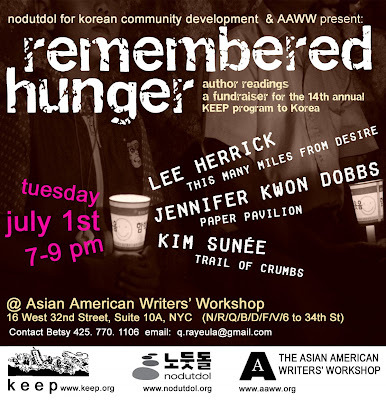 KEEP'er Jennifer Kwon Dobbs herself is reading this night! Please forward this on to your New York-dwelling peeps, and you can also click on the flier and save it to your computer too to forward. Another little-mentioned aspect of Korea before and after division are the people's committees that quickly formed all throughout Korea upon the end of World War II and Japan's defeat, from August 15, 1945. 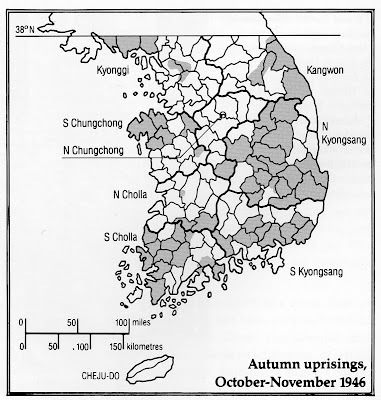 In understanding the general lack of awareness about people's committees in this time, we can point to the fact that these insitutions of self-rule were promptly and thoroughly suppressed by the United States military government as soon as they came to occupy the southern part of the peninsula in September. What were people's committees? Briefly, they were local self-governing bodies which organized all aspects of political, economic, and social decision-making necessary to restore peoples' lives and basic services as the Japanese colonial government left. They kept the order and organized food harvesting and distribution, set up legal bodies, etc. They were of various political ideologies, and only excluded those people who had collaborated most closely with the Japanese. But when the Japanese colonial administration left, they convinced US military commanders that the emergence of these political bodies was led by Communists. So the US military government also sought to eradicate these independent people's committees. Naturally the most conservative elements of Korean society, such as the landlords who had profited under Japanese colonialism, were also against the redistribution and justice-oriented designs of the people's committees. 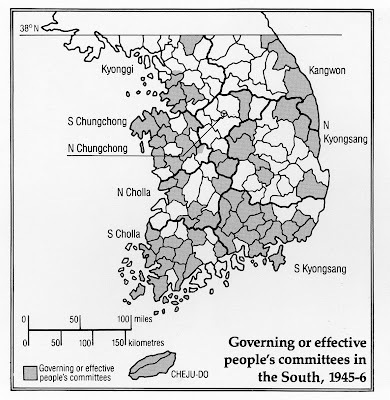 The picture below, of this time period, shows the extent and geographic spread of these people's committees in the South, and challenges the idea that people in Korea were not ready to govern themselves. What else do people know about people's committees? Another link (from US Library of Congress sources, no less) on people's committees. Welcome to the group blog for KEEP 2008. We are Korean-American and Korean-Canadian community workers, educators, organizers, artists, writers, students in cities all over North America. 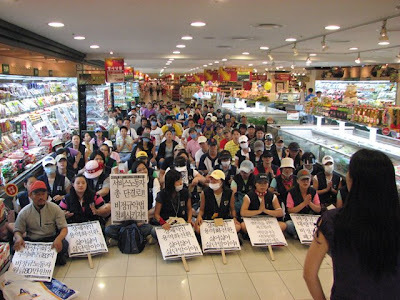 In August 2008, we will be converging together in south Korea to build solidarity with and learn about Korean people's movements and organizations. We will sweat. We will sing. 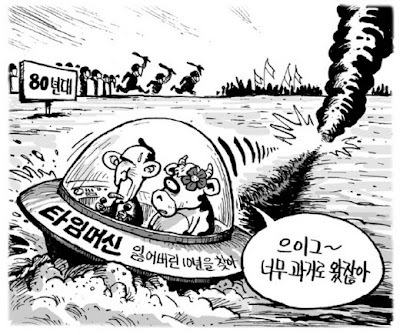 We will farm, march, dance, and light candles with Korean people for democracy. And we will blog. The mission of KEEP is to increase awareness of and strengthen the global movement for peace and justice on the Korean peninsula. Through building relationships and communities, KEEP seeks to broaden our understanding of and participation in the liberation struggles and unification of the Korean people. 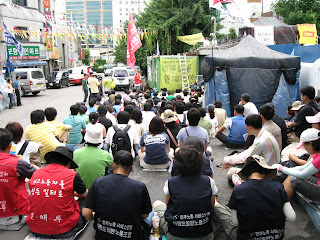 KEEP 2008 is the 13th annual solidarity program to South Korea. For more information about the program, check out: www.keep.org.